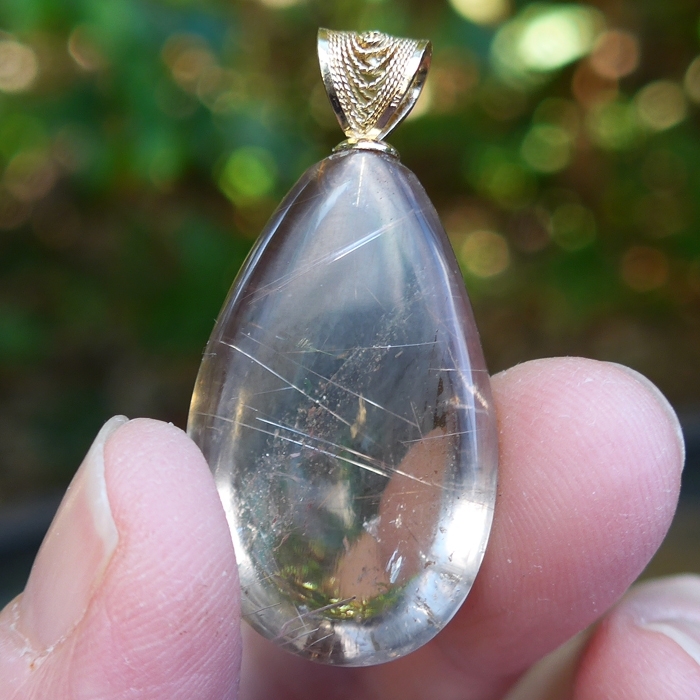 Dimensions (HxWxD): 1.5" x 0.75" x .45"
This stunning 1.5 inch high 40+ carat Angel Hair Rutile Teardrop Cabochon Pendant has an amazing energy to it. 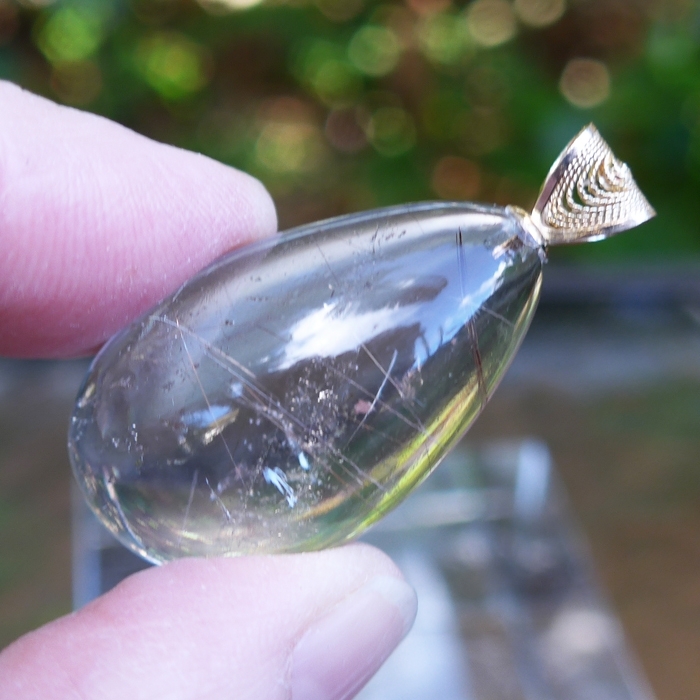 This unique AAA golden rutile cabachon is capped with a 14 kt. Gold Filigree Bale and comes complete with its own YGF chain, in a velvet jewelry box. The back side of this pendant is flat so it will sit properly on your chest. There are some inclusions in the back half of the pendant, but none comes near the surface and they are more prominent in these pictures than in real life. We are proud to offer our customers custom-designed, hand-made crystal pendants -- made by Satya -- that come from American jewelers in New York city, whose work is demonstrably of the highest quality. Jane and I selcted a small number of golden rutile stones from trays of hundreds we inspected, picking only those stones with a powerful energy signature and mineralogical interest. We had this gorgeous rich golden rutile pendant set in a unique handmade 14 karat gold setting which was custom created for Satya Center by a very talented Manahttan jeweler, located on legendary 47th Street, in the heart of the Diamond District. 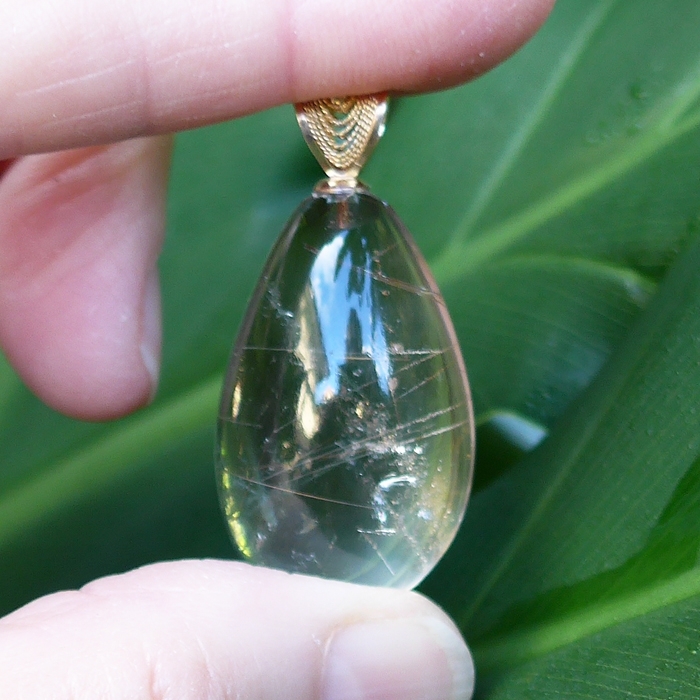 This AAA gold angel hair rutilated quartz cabachon contains needle-like inclusions of titanium inside it. Rutile is a titanium ore. Titanium is used in high tech and aerospace alloys because it’s a lightweight super-conductor of electrical energy, exhibits great tensile strength and resists corrosion. Rutilated quartz crystals have a high-energy charge, which is particularly effective in releasing energy blockages. For energy healing, wear this rutillated quartz pendant over the thymus, and it works to energize a sluggish immune system. Compared to other forms of quartz, rutilated quartz has a greatly enhanced ability to help dissolve any energy congestion. Rutile is good at repelling negative energy and ending unwanted interference. Rutile promotes and strengthens stability in relationships and marriage, and works to eliminate emotional and physical imbalances. Rutile is very "electrical" and affects physical, etheric and astral bodies. Rutilated quartz is said to be a regenerator of people, crystals and plants, and to help one to resist aging and the general cellular breakdown caused by time. According to Melody, rutile "has been known to represent the lovely hair of Venus and the 'sweet' tipped arrows of love. It has been likened to the appearance of wheat straw and angel hair. . .The ethereal aspects of rutile, when found in another crystalline form, bring strength and love, ease in transition, growth in all avenues of one's development, and calm, reason and order. Rutile is used for healing and balancing the aura via repelling negative energy. It affects the physical, etheric and astral bodies. . .It is a stone for stabilizing relationships, marriages, mental processes and emotional and physical imbalances." Note: Above weight is shipping weight. Net weight is 10 grams, excluding chain. Net weight of cabachon is approximately 40+ carats.